It's been a couple of weeks since my last blog entry. How's everyone doing? I hope you enjoyed your Christmas holiday with friends and family, and New Year's Eve is just around the corner; too bad I can't get a Beach Blanket Babylon ticket for Saturday's 10PM show (totally sold out), that would have been fun to watch and celebrate the new year. 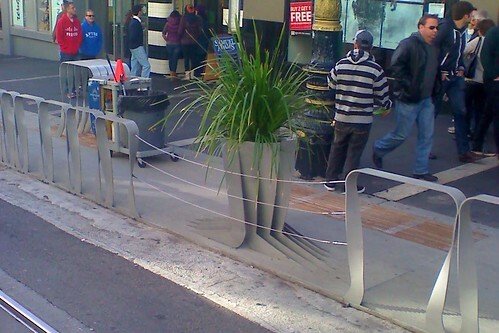 Let's get on with a new blog entry today... how's the Powell Street parklets doing? Things are turning out for the better after several months. The barriers separating the parklet from the road are not getting bent out of shape from people sitting on it, and it's being well maintained. Has anyone tried the free wifi access that's being powered from the solar panels? I haven't. The newest improvement they've done is place steel cables between the gaps in the parklets to prevent jaywalking. The trash can looking objects that holds plants wasn't doing a great job in preventing someone from jaywalking and getting hit by a Cable Car or car, so the new cables are doing the role. It's good they are using steel cables because the stuff that's keeping people from jaywalking from the Ocean Beach parking lot to the Beach Chalet keeps breaking and people risk their lives crossing a four lane road with vehicles going at 35 MPH. Even then, jaywalking is still rampant on Powell Street because the parklets doesn't cover the entire blocks as they still need unloading/drop-off zones for deliveries and taxicabs for the hotels. 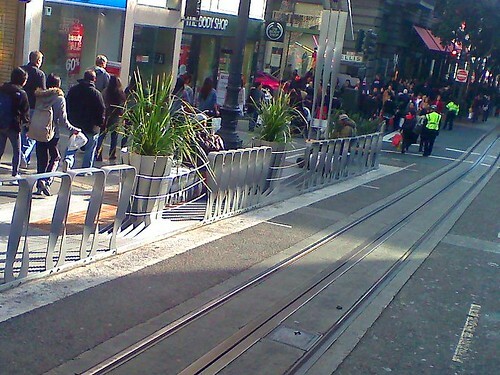 I'm proud my blog has forced the city to make essential upgrades to the Powell Street parklets in the name of safety, but I'm still disappointed it took them so long to do it. To read the entire Powell Parklet saga: First blog entry, repair update, and second repair update. If there's so much jaywalking going on at a location, perhaps they need to consider providing better access -like another crosswalk. That Powell Street break where the loading zones are is a perfect location to cross as it's halfway down the block and usually traffic is stopped at both intersections. Perhaps another signal timed in with the other two for a crosswalk would be beneficial there. The same goes for the Beach Chalet area, if possible. I've always believed that if there are lots of people jaywalking then it's a sign of poor pedestrian planning.